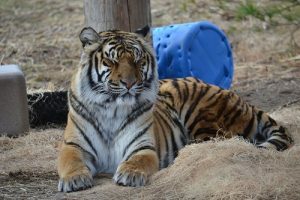 The Wildcat Sanctuary recently participated in what’s being called “the largest rescue of big cats in U.S. history.” With over 110 exotic animals in need of homes, the numbers could feel overwhelming. We’re forever grateful for the organizations that initiated these placements. With the outpouring of support from YOU and so many credible sanctuaries, the animals are now moving to their forever homes. The day we loaded Pandora is a day I won’t ever forget. We were onsite at the facility to pick up a different tiger. There were so many needing new homes. But the original tiger we came for had become stressed, and it was in her best interest to let her calm down vs. transport her. We offered to come back to get her when we had time to move her with the least amount of stress (and that offer still stands if another sanctuary can’t accommodate her). Instead, we decided to help another tiger there, since there were so many in need. As we walked through the compound, one girl caught my eye. So much so, I had to look twice. For a moment, I thought I saw Meme, the first tiger we rescued here at the sanctuary. It was as if I went back in time. I was so taken aback, I couldn’t tell you if she looked like Meme, or if she just felt like Meme. A very calm girl amongst the chaos. She quickly approached, chuffed, then rolled to expose her belly. There was something so sweet and wonderful about her. She was Pandora. Pandora is a gentle girl, still a little cautious of her open space here. Spending 12 years at one facility, her new world can be a little intimidating. She’s beginning to explore her habitat, scratch her perches and explore new areas. She finds comfort with her caregivers, and doesn’t miss an opportunity to chuff “hello” through the fence. She hasn’t gone into her heated building just yet, so our caretakers have provided her a heated den box. A wood den box was all she had for shelter at her previous home, so the familiarity brings her comfort. Each day she continues to spread her wings more and more. And each day I ask Meme, our first and very special tiger, to help lead the way for her. I know you’re also sending and supporting her with love. Thank you! Your support helps more than you’ll ever know. There’s so much out of our control, but giving tigers like Pandora a forever home is something we can do. And you make that possible! I’m forever grateful we could provide Pandora, and the three other tigers that came, a home. Pandora – and every cat’s history – is important. Cats should never be bred for profit, to be a pet, or be destined to life in a cage. As I look at Pandora with the sun hitting her face, and she surveys her new home, I can’t help but want to focus on her future. The future YOU can help provide for her. Taking in tigers to care for is very expensive and we know Pandora would LOVE to have you as her sponsor parent! If you’d like to find out more about how to sponsor any of our cats, please visit our sponsorship page HERE. Why did Pandora need surgery? Several of the tigers from that facility had to have emergency surgery for reproductive issues shortly after being rescued. Pandora’s mother and aunt had reproductive issues that led to emergency surgeries at other sanctuaries. The good news is, if Pandora’s surgically spayed, she should go on to lead a long, healthy life. You can read about her surgery at the University of Minnesota, with photos and news coverage HERE.